Sceaux Castle (Chateau de Sceaux) is located in the stunningly beautiful historic district, near Paris, which is now known as the "Museum on the French island". Sceaux is actually a large and attractive house surrounded by a charming park in a typically French style that is close to the capital region Hauts-de-Seine. There in the castle itself Sceaux you can see the museum of local history. Manor Sceaux extends over 180 hectares within the two French municipalities. The all beautiful complex has become an essential part of everyday life for local residents, but the truth is that over the years Sceaux has become one of the favorite places of Paris for a getaway from the bustle of the city. Largely this is due to the proximity to Paris, Sceaux stands on a hill, located just 10 km from Paris. 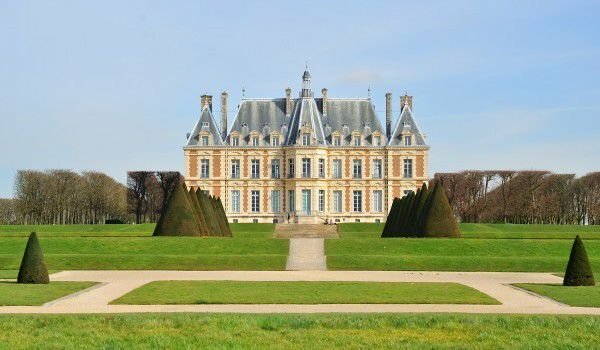 Many tourists come to the castle complex Sceaux just to relax on weekends or simply stroll around the charming gardens with their perfectly arranged official paths. The actual castle also has excellent conditions for fishing, sports venues and other areas dedicated to children's playground. Chateau de Sceaux is mentioned in historical documents from the 15th century, when the Potier de Gesvres family were present in the mansion, but little of this structure was able to be maintained until today. This palace was built around 1670 when the property was purchased by Jean-Baptiste Colbert who homed the office at that time - Minister of Finance, during the reign of King Louis XIV. For the raising of the gleaming Sceaux castle, Kolbert turned to some of the best and most respected construction architects, as then it was the brothers Claude and Charles Perrault. In 1683 Kolbert's son - Marquis de Seignelay, took one kilometer of the channel for excavation of the castle near Sceaux. The designer of the brilliant gardens was Andre Le Notre, who turned the castle into a true paradise. The beautiful walks and flower beds complement the various levels of fountains, which flow into a large octagonal pool. In 1685 a beautiful conservatory, designed by Jules Hardouin-Mansart was opened in the castle Sceaux. Later this building was converted into a simple cabin from subsequent owners of the palace. From 1937 onwards the Sceaux castle functions as a museum and is open for public visits. Interesting to see is the huge collection of works by some of the greatest masters of French art school. You can also learn more about the local history of the French region of Ile.